Fulton, Mo. native Henry Glotfelty knew at a young age that he wanted to teach at a university. 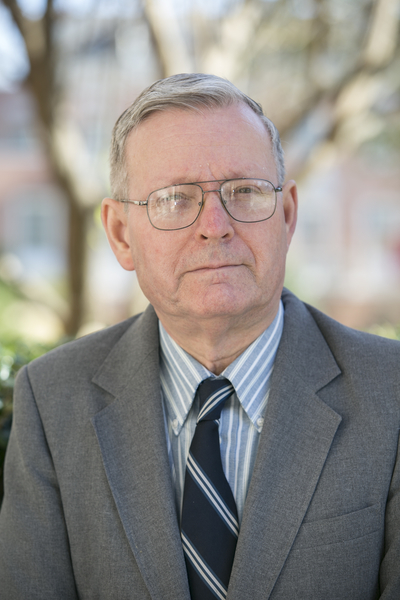 He joined Samford's faculty in 1978 and currently teaches courses in astronomy, physics and electronics. Most semesters he also leads physics and astronomy labs. In fact, Glotfelty most enjoys being a part of students' learning process in the lab. Glotfelty is fascinated with how physics are applied, especially in the discovery of new planets via the Kepler Telescope. When Glotfelty isn’t instructing physics and astronomy labs he likes to work in his yard and workout at the gym. “Covalent bonding in the octahedral hydrated complexes of the Lanthanim zinc double nitrate crystal from a magnetic resonance investigation.” The Journal of the Alabama Academy of Science, Volume 62, Number 2-3, 1991. “Magnetic resonance study of the protons in the hydrated complexes of cobalt: Lanthanum zinc double nitrate.” The Journal of the Alabama Academy of Science, Volume 60, Number 3, 1989. “The physics of Eratosthiene S.” The Journal of the Academy of Science, Volume 61, Number 3, 1990. “Electric quadrupole interactions in the cobalt doped lanthanum zinc double nitrate crystals.” Bulletin of the American Physical Society, Volume 34, Number 10, 1989. “Magnetic resonance study of the cobalt ion in Lanthanum zinc double nitrate.” The Journal of the Alabama Academy of Science, Volume 59, Number 3, 1988. “Covalency of hydrated complexes of Co 2+ from 170 Endor.” American Institute of Physics Conference Proceedings, Volume 24, page 210 1974. “Computer interfaced data acquisition system for EPR and Endor.” Bulletin of the American Physical Society, Volume 20, page 387, 1975.